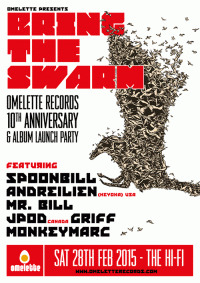 Omelette Records returns to the fold in full force with Spoonbill at the helm of an expanded and improved ship, reinforced for their epic 10 year anniversary compilation entitled: Swarm Theory! This whopping 16 track album has been forensically compiled to include a choice selection of 16 artists hailing from 7 different countries: Australia, New Zealand, USA, Canada, UK, Hungry & France. The swarm of artists included is at the top of their game and are celebrated globally for their innovations in modern electronica. The collective strength of the swarm outweighs the sum of the individuals and united together this release serves as a milestone for modern groove electronica. 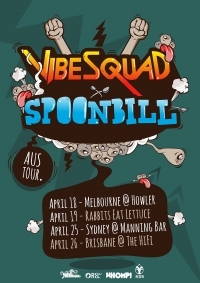 Spoonbill and Vibesquad team up to bring the east coast of Australia some serious groovin party times. the duo will perform in Melbourne, Brisbane, Sydney and at Rabbits Eat Lettuce festival (Byron Bay area) over mid April 2014. 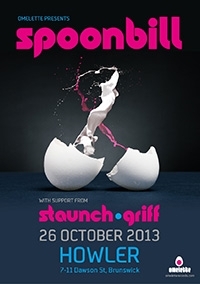 Spoonbill Live - Footage taken from shows at HiFi Bar Melbourne, Rainbow Serpent Festival, and The Tanks, Cairns. Featuring track edits of: Big Dipper, Stacking The Feedback (feat. VibeSquaD) & Munstermec From Boca Fiesta EP.